It’s finally here . 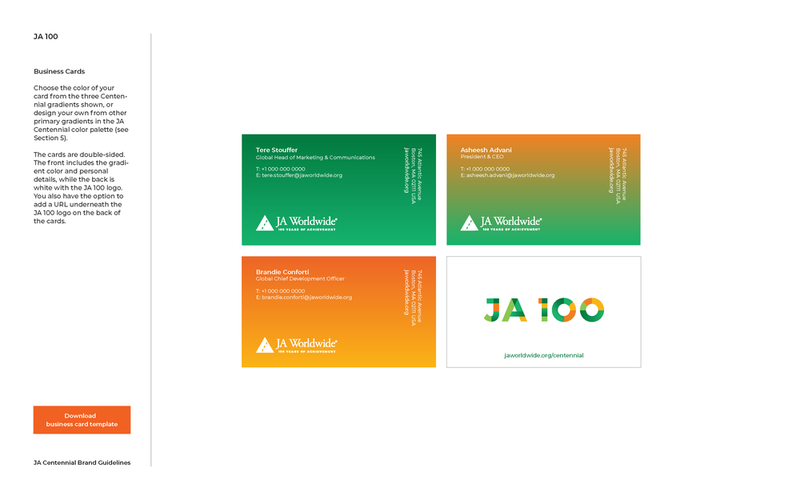 . . the Centennial celebration of JA and the JA Company Program! 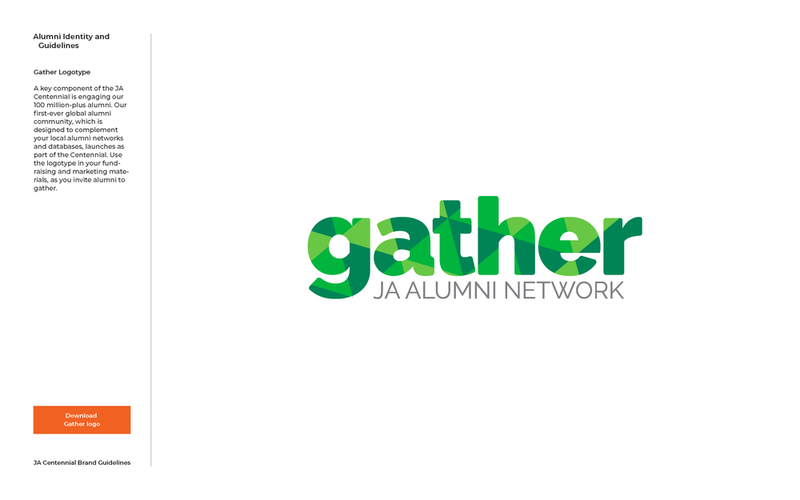 During our Centennial celebration through 2019, JA locations from New York to Nigeria are hosting events, honoring alumni, and garnering media attention. 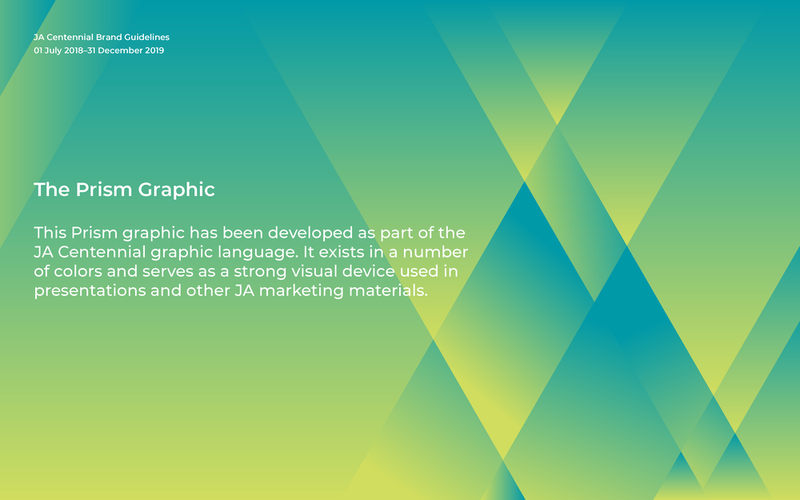 To help us celebrate, we’ve introduced a collection of Centennial collateral, including the JA Centennial Brand Guidelines in this section of OneJA. You can either download a PDF of the guidelines, which includes links to all the collateral, or keep scrolling below. We hope you enjoy the design concept and all the beautiful—and useful—marketing and development materials coming your way. If past experience is any indicator, our wonderfully diverse network will celebrate the 100th anniversary of our organization in hundreds of unique ways, which is why the Centennial Brand Guidelines offer maximum flexibility and opportunities to customize. Even our two Centennial taglines—that’s right, two (“100 Years of Achievement” and “100 Years. 100% Ready.”)—demonstrate that JA locations have diverse needs. Having the flexibility to meet those needs is what makes our network so special. 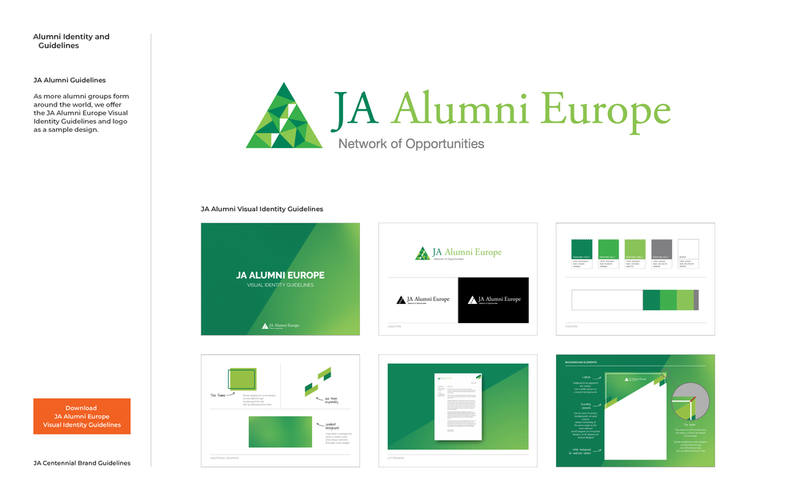 Our hope is that the entire JA network will rally around one element in particular: the “JA 100” logo. 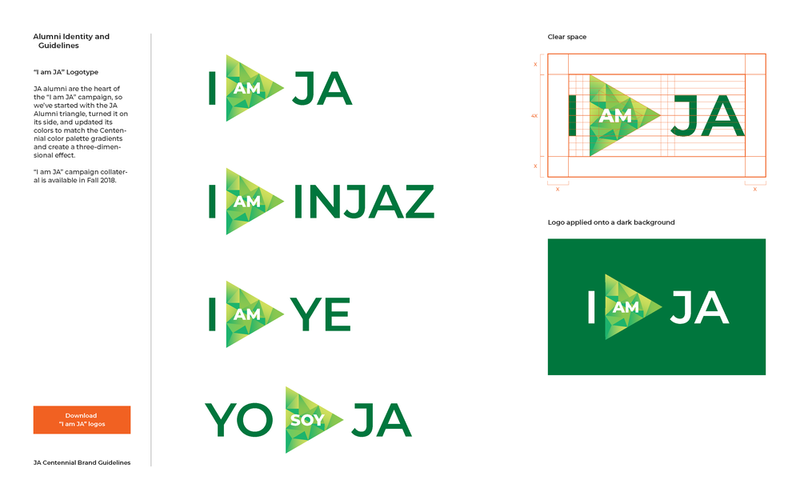 This bold, colorful graphic will be so appealing on your merchandise, social-media channels, event signage, and updated letterhead and business cards that our good-old JA logo is likely to feel snubbed. So, we gave that a sprucing, too . . . you’ll see your options in these guidelines. 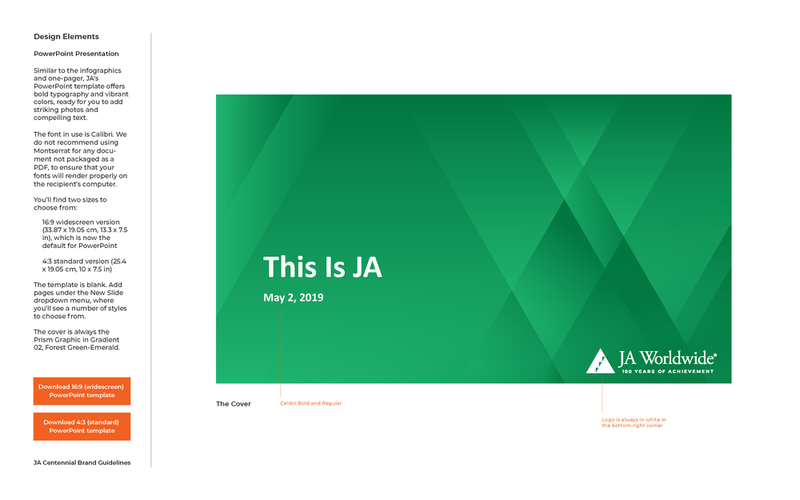 All the collateral you need to get started is linked to within the downloadable JA Centennial Brand Guidelines and as you scroll below, and that includes our well-loved classics (the color bar and variations on triangles). 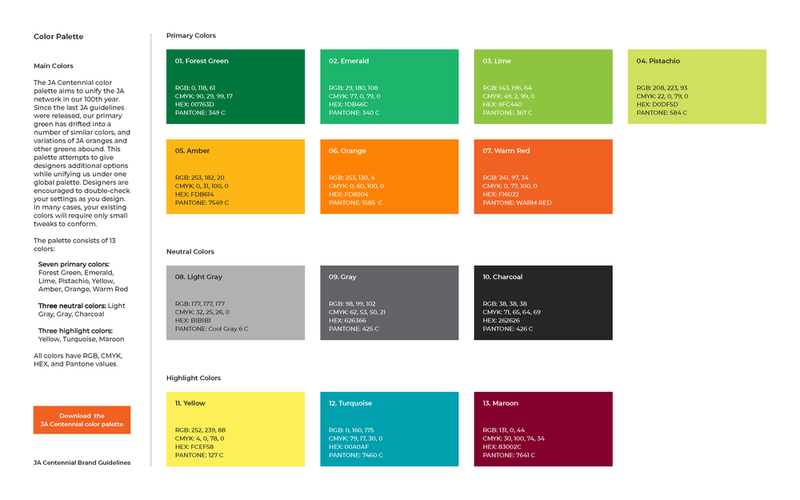 They’ve been updated ever so slightly to match our colorful Centennial theme, and we encourage you to update those files. Above all, we’d love to hear how you’re using and adapting this collateral to meet your needs. Please don’t hesitate to reach out with questions, comments, ideas, and a bit of bragging, whenever you’re ready to share your best work.